What is the Target Bet in Binary Options? Target binaries are another type of binary bet that traders can play in the binary options market. The underlying principle of target binary bets is to predict if the market will end up in either a positive range, or a negative range. – Positive targets, which is a type of binary bet in which the trader speculates that the financial asset in question will end up in a positive range. An example of this is if the trader trades a stock index future such as the NASDAQ and he bets that the NASDAQ will end up in positive territory by about 50 pips. – Negative targets, where the trader speculates that the financial asset will end up in a negative range. To borrow from the example above, the trader can place a bet that the NASDAQ will end up in negative territory by about 50 pips. 1) The trader has to select the financial asset on which the binary bet will be made. 2) The trader has to specify the trade direction the asset will end up. Will the asset end up in positive or negative territory? 3) The trader has to specify the degree to which the trade will end up either in positive territory or negative territory. Let us take for example a trade on the Dow stock index future, where the trader is trying to bet on a positive or negative outcome for the Dow, within a specific range. Such a trade is extremely tricky, as no one can guarantee in what direction the market will end up and by how many pips it will move in the chosen direction. To be able to execute this trade successfully, the trader has to know what the average daily movement of the financial asset he wants to trade is. For a currency like the EURUSD, the average daily movement in any direction is 100 pips. For gold, it can be as much as 10,000 pips in times of great volatility. For crude, it could be anywhere from 200 pips to 500 pips. Why is this necessary? If a trader places a positive target binary trade for gold at +100 pips at a time when there is general concern about the state of the world’s financial markets, the trade is already doomed to fail. This is because the massive demand for gold as a safe haven investment will push the asset to move far beyond 100 pips. In the same vein, you cannot expect a currency pair like the USDZAR that has a daily movement of an average of close to 900 pips to perform just a 50-pip movement. Get the drift? One other thing every trader trading the target binary bet has to know is how to use indicators that can predict the average movement of a currency in certain conditions. 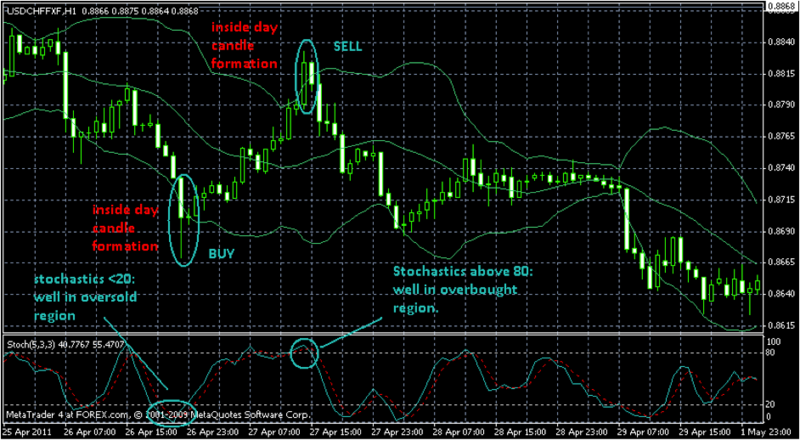 I am talking about using indicators like the Bollinger bands and the stochastic indicator. The Stochs indicator is a momentum indicator that indicates when a market is overbought or oversold. When combined with the Bollinger band indicator that is very good at defining the upper and lower limits of the market in periods of consolidation, the trader can easily get an idea of how far the market will move and in what direction. Look at the chart below to get an illustration of this strategy. In the left half of the chart, the market is clearly in consolidation, which tightened as we move along to the right of the chart. The Stochs show the overbought and oversold conditions, while the Bollinger bands show the range of price movements. – At the “Buy” region, I would place a positive target binary bet, using a range of 80 – 120 pips. – At the “Sell” region, I would place a negative target binary bet, using roughly the same range. This is just an example, and the conditions are not by any means perfect. It is just an illustration of a possible trade scenario, which would require a lot of training and practice to engage in this type of binary bet.